Aerospace & Defense Fluid Conveyance Systems Market size was valued at over USD 17 billion in 2017 and is estimated to exhibit over 3% CAGR from 2018 to 2024. Substantially rising production, especially for regional jets and commercial aircrafts across the globe will primarily drive the industry growth. Continuous growth in military sector, particularly in developing countries has resulted in proliferating demand for military aircrafts, further escalating the revenue generation. Rising demand for lightweight conveyance systems for distributing and managing the fluids in high and low-pressure areas will force the manufacturers to develop enhanced products. This will positively impact the aerospace & defense fluid conveyance systems market over the forecast timeframe. Rising urbanization across the globe has led to high preference towards air travel that has resulted in increased aircraft deliveries, strengthening the product penetration. Moreover, the industry is witnessing regular advancements in fluid conveyance technology owing to rising need of developing high-thrust turbofan engines. These engines highly require conveyance systems, resulting in high production. 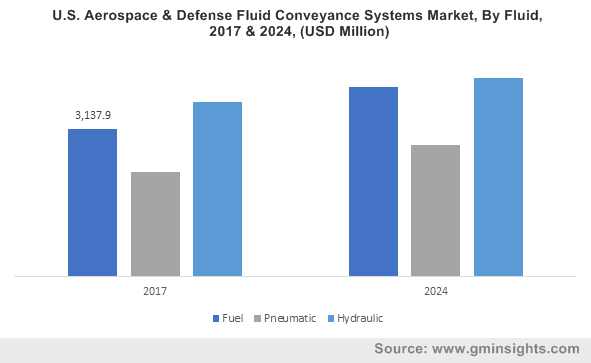 Shifting business activities from traditional western markets towards developing economies will further offer stable growth prospects to the aerospace & defense fluid conveyance systems market participants. Manufacturing of these systems requires the usage of high quality materials which in turn increases the overall product cost, hampering the aerospace & fluid conveyance systems market growth over the next seven years. In addition, the industry participants face a challenge associated with quality accreditations. Recyclability issues of the composite materials along with backlog in aircraft deliveries are other factors negatively impacting the business growth. Rising demand for lightweight materials, energy-efficient engines, and consumption of alternative fuels are among the major trends witnessed across the aerospace & defense fluid conveyance systems market. The aircraft manufacturers are indulged in adopting several cost reduction initiatives including lean manufacturing process, waste reduction activities and establishing new commercial terms. One stop system integration is a technology developed by Parker that has gained prominence among the established aerospace industry leaders. The company is a team partner with Boeing 787 and created a hydraulic equipment module by integration of 60 components into a single sub system. This system is designed to provide hydraulic support and structure while reducing the production flow time of the aircrafts. 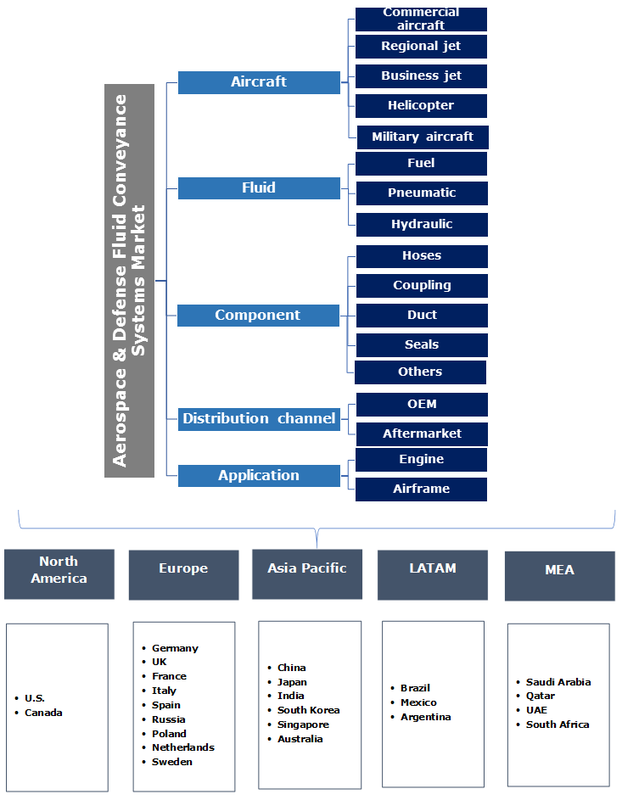 Commercial aircrafts are likely to showcase dominance in the aerospace & defense fluid conveyance systems market with over 80% revenue share over the next seven years. This can be credited to the substantial production of these aircrafts across the globe. The aerospace industry has also witnessed increasing demand rates of the aircrafts such as B737, A350XWB, B787, and A320 family. Rising disposable income has resulted in shifting preference towards air travel. This has led to a surge in passenger traffic, especially in developing countries, further contributing to the revenue generation. Aerospace & defense fluid conveyance systems market from regional jets is expected to grow rapidly, witnessing over 5.5% CAGR from 2018 to 2024. Rising investments across aviation industry owing to high profit margins will propel the industry growth. Moreover, regional jets provide the customers with optimised capacity that results in high preference towards these aircrafts, further impacting the industry positively over the coming years. Hydraulic fluid system is expected to capture maximum share of approximately 40% by 2024. This can be attributed to their prominence in carrying out various flight critical operations. Moreover, it ensures negligible losses due to fluid friction, cost-effective to install, and comparatively easier to maintain. High operational efficiency for flight control surfaces, landing gear, brakes, and flaps are few other factors which will enhance the penetration of aerospace & defense fluid conveyance systems market from hydraulic fluid systems. Aerospace & defense fluid conveyance systems market from fuel systems is likely to exhibit growth at around 4% over the next seven years. Regular technological advancements for developing high quality and enhanced systems will essentially drive the segment’s growth. The industry participants focus on offering vast range of fuel conveyance systems to cater to the requirements of the maintenance systems, further propelling the industry growth till 2024. Ducts are likely to dominate the aerospace & defense fluid conveyance systems market, accounting for over USD 7 billion till 2024 owing to their high deployment from engines to leading edges of the aircraft wings. Moreover, ducts find their applications in thermal anti-ice systems, fuel tank inerting systems, engine bleed air, and starter systems. The industry participants are focusing on the usage of enhanced metals, including titanium and nickel for offering high quality ducts, further strengthening the product penetration. Hoses will exhibit approximately 4% CAGR over the forecast timeframe. Their extensive usage to transmit the fluids to valves, components, tools, and actuators will primarily drive the industry growth. The component is highly flexible and is made with multiple layers of reinforcement. High usage of materials such as rubber, stainless steel, etc. for their construction will further attract the customers thereby propelling the segment’s growth. Aerospace & defense fluid conveyance systems market from OEMs will dominate the overall industry share, accounting for USD 14 billion by 2024. The conveyance systems are already installed in the aircrafts in large quantities for transmission of fluids. Rising production of aircrafts across the globe is primarily accelerating their demand, contributing to the revenue generation. Moreover, the aerospace industry leaders focus on equipping their aircrafts with enhanced components, further strengthening the industry penetration. Aftermarket is anticipated to grow at over 3.5% from 2018 to 2024. This can be credited to increasing replacements of intricate systems, particularly in ageing aircrafts across the globe. Proliferating demand for advanced systems along with maintenance of quality standards by aftermarket players will further drive the aerospace & defense fluid conveyance systems market share over the forecast timeframe. Airframe dominated the aerospace & defense fluid conveyance systems market in 2017 and is likely to continue the same with over 60% revenue share till 2024. High deployment of these fluid conveyance systems in airframe applications such as landing gears, flight control surface, brakes, etc. will essentially contribute to the revenue generation. High preference towards hydraulics systems for these applications owing to their benefits will enhance their production rate, further supporting the industry dominance. Engines will witness growth at over 4% from 2018 to 2024. These systems are increasingly being used for providing the ground up support and transferring the fuel from the tank to aircraft engine, driving the segment’s growth. North America is likely to dominate the global aerospace & defense fluid conveyance systems market, accounting for more than 50% share by 2024. Substantial production of aircrafts along with the presence of numerous ageing aircrafts across the region will primarily contribute to the revenue generation. Moreover, the region witnesses high presence of components manufacturers such as ducts, hoses, seals, etc. that has resulted in high production. This will further support the regional dominance over the next seven years. Asia Pacific aerospace & defense fluid conveyance systems market is expected to grow rapidly, exhibiting over 4% CAGR from 2018 to 2024. Substantially growing number of aircraft deliveries owing to increasing air passenger traffic, especially in the countries including China, India, Australia, and Japan will positively impact the region’s growth. Eaton Corporation, GKN Aerospace, ITT Corporation, Parker Hannifin Corporation, Triumph Group, Encore Group, and Arrowhead Products Corporation are among the noticeable participants in the aerospace & defense fluid conveyance systems market. Other prominent industry players include AIM Aerospace, Exotic Metals Forming LLC, Stelia Aerospace, Unison Industries, United Flexible, Meggit Plc, and Senior Plc. Product offering is among the prominent strategy adopted by the competitors to enhance their visibility among the customers. For instance, in February 2014, Unison Industries was awarded a contract by Snecma for providing its transit bleed valve and low-pressure turbine active clearance control fluid conveyance systems for its CFM International LEAP-1B engine. These strategies will induce immense potential to the aerospace & defense fluid conveyance systems market size till 2024. The fluid conveyance systems constitute of the components that carry critical liquids across the aircraft. They are essentially responsible for distributing and managing the fluid flow in high and low temperature areas of the aircrafts. Every component installed in a fluid conveyance system is deployed for serving its specific purpose across various aircraft parts. Rising production of aircrafts across the globe along with high demand of installation of advanced systems in these aircrafts will drive the aerospace & defense fluid conveyance systems market growth till 2024.